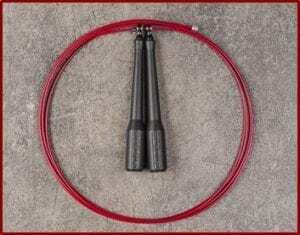 A weighted jump rope is one of the simplest and most effective at-home workout tools out there. Over the years, weighted jump ropes have been proven to offer an array of health benefits, including enhanced strength, agility and coordination. They also promote muscle-building and weight loss (Source). This being the case, such ropes are best suited for cardiovascular workouts. Despite the vast array of jump rope designs and designs available today, choosing the right one can be a challenge. In this regard, you need to consider the rope material, availability of swivel bearings on the handles and the rope length. To make this choice a bit easier, here are reviews of five of the bets weighted jump ropes available today. Are you training for boxing, Crossfit, cardio, MMA or are just looking for the best weighted jump rope to build stamina? 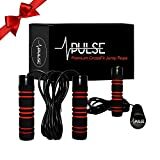 Regardless of the case, you will find very few products as good as the 1 lb Pulse weighted jump rope. This product is specifically designed for enhanced performance and ease of use. To begin with, the rope features a perfect weight distribution around the handles. This makes it easier to use when trying to burn more fat and calories whilst building lean muscles. Additionally, the 1 pound handles that come with this product are removable. This allows you to use handles of your preferred weight in accordance to your training needs. Still on adjustability, the length on this product is also customizable. In this regard, it allows you to adjust the length from 10 feet downwards. This way, you will be able to work out with your preferred rope tension. With the crossrope Jump Rope Get Lean Set, losing weight and maintaining physical fitness has never been easier. To help you achieve this with ease, the product is packed with some of the best features in the industry. The set includes several weight options to meet various training needs. If you are looking for a speed rope for your high intensity training, the ¼ pound infinity rope will come in handy. The ½ pound infinity rope, on the other hand, is best suited for endurance and strength building exercises. The product features some of the best ceramic ball bearings in the industry. 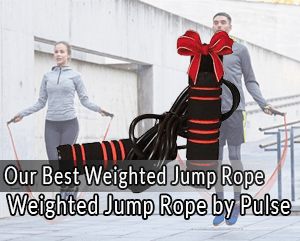 This, along with the fast-clip system by the manufacturer, makes it easier for you to switch between heavy jump rope training and speed rope training. The ball bearings used on this product are of exceptionally high quality. As such, you will find the bearings relatively durable. Depending on your training goals, this product allows you to choose your preferred rope weight. In this regard, the Rope Fit Heavy Jump Rope is available in 8-pound, 7-pound, 5-pound and 4-pound options. Again, the product is offered in several lengths to suit users of different heights. For best results, it is advisable to choose a rope of the right length. In this regard, the 10-foot Rope Fit Jump Rope is recommended for users taller than 6 feet. If you are less than 6 feet tall, you should go for the 9-foot long rope. Having been manufactured in the USA, quality is not a concern for this product. Owing to their weight, these ropes allow you to burn up to 1,000 calories per hour, depending on the intensity of your workouts. When used appropriately, this product can help you improve your agility, endurance and leg sped. If you are looking for a lightweight jump rope, the Buddy Lee Jump Rope will come in handy. Though lightweight, the product has an array of efficiency features you will love. 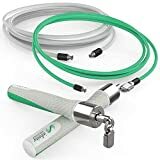 The product features a patented swivel-bearing system that connects the PVC rope to the handles. This allows for a tangle-free and fluid swing. As such, you will find the product suited for high-intensity interval training as well as for double unders. The product comes with an adjuster wrench and a sizing guide. As such, you will have an easy time adjusting the length of the rope. As a beginner, you will realize that to all the available weighted jump ropes are suited for your workouts. To gain the best form your training sessions, you should consider using a rope that is designed for beginners. 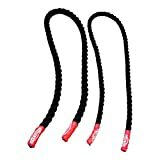 The BuyJump Ropes Boxers Jump rope is one of the best training ropes for beginners and children today. Since it is designed for beginners, the rope is comparatively slow. The product features a 5 mm solid-core PVC cord. You will also love the fact that the length of this rope is adjustable. In this regard, you can easily adjust the length up to 9.6 feet. The handles on this product are backed by a 2-year warranty. Would you like to start jumping or are just looking forward to upgrading your jumping equipment? Regardless of the case, you should ensure that you buy the bets weighted jump rope you can afford. Just as jogging, jumping a rope has been proven to offer several health benefits when used as an exercise. As you may have noticed, there are numerous weighted ropes in the market today. As such, choosing the right product for your exercise needs can be a daunting task. This is particularly a problem if you do not know what to look for in a jumping rope. Are you an athlete practicing aerobic conditioning or Crossfit boxing? If you are, fabric weighted jump ropes will be the right exercise tools. Being some of the commonest jump rope types, you should not have a problem choosing the right fabric jump rope. Most fabric jump ropes have plastic handles and either nylon or fabric ropes. Owing to their comparatively poor quality, these are some of the most affordable jump ropes in the market. Such products are only meant for use indoors. When used outside, they may absorb moisture and become heavier. These ropes are best suited for enhanced leg speed and coordination. As such, they will come in handy for training in sports where agility is required, such as boxing. Leather jump ropes have wooden or plastic handles. As compared to plastic and fabric ropes, leather jump ropes are faster. Since the ropes are made of leather, their use should be limited to indoor environments. This is because moisture predisposes them to damage. Being some of the best jump ropes, leather ropes are recommended for serious cardio exercises. These feature plastic beads strung along a relatively thin nylon cord. In most cases, the plastic beads are of different colors. While these are attention-grabbing, they are not recommended for serious workouts. As such, they are best suited for beginners. For beginners, these ropes offer enough weight for a great muscular feedback. If you are a beginner, this is not the right training tool. These products are best suited for double unders. Again, these ropes are also best suited for Speed Jump Roping. Basically, these ropes are known to produce minimal muscle fatigue. As such, they are also great for competition applications. If you really cannot feel the 2.5 mm steel ropes, you should get a 4 mm steel cable jump rope. If you are training for boxing, you should invest in a good 4 mm steel cable rope, preferably the plastic-coated ropes. These ropes will allow for higher speeds, hence help you carry out resistance training more effectively. 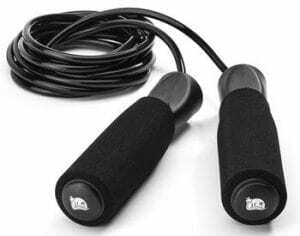 As opposed to the other jump rope types discussed above, weighted jump ropes feature additional weights on their handles. If this is your preferred option, it is advisable to go for the thicker options that allow you to add weights. Such products are great for building endurance, speed and power. How long should your jump rope be? The right jump rope should be long enough for you to hold the handles just about the armpits. As a rule of thumb, the right rope should be at least three times your height. While this is the case, an adjustable product will be the best option. By allowing you to change the rope length, such a product will give you different jump rope intensity levels for optimal workout experience. One of the problems associated with the various jump ropes available today is friction. The amount of friction produced by the rope as it turns around the handles can affect the effectiveness of your exercises. To avoid this problem, you should consider buying the best Crossrope products with a good ball bearing system. This reduces friction at the handles, which allows the rope to spin at higher speeds. As such, you will be able to have great workout sessions with such a product. This will, in turn, improve your agility more effectively. In addition to healthy eating, you will need to carry out the right exercises for you to lead a healthier life. Jump ropes are some of the most effective tools when it comes to strength and resistance training for athletes. With so many products to choose from in the market, choosing the right weighted jump rope can be challenging. As you have learned throughout this guide, there are several things you need to consider while shopping for the best rope. Regardless of your individual preferences, choosing the best weighted jump rope should now be easy.